After an amazing performance of Fiddler on the Roof one month ago, I committed to way more shows this summer. And true to my promise, I went to see another play this week at The Cameri Theater called Ghetto. Ghetto is about an active theater in the Vilna ghetto during WWII. The music was great and the acting was superb, but the story line was too muddled and the end drawn out. 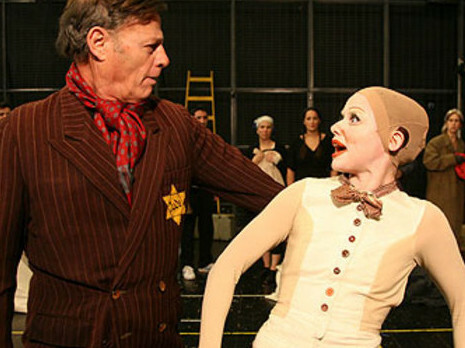 Since the play was in essence a Holocaust story, I surprised myself that I neither sobbed nor sunk in grievance. After all, I am that girl who bursted out crying on several occasions in the Jewish History class at a lecture hall of 350 students. In short, the Ghetto didn’t really move me. But, this experience did drive one very important point home. Only in Israel can you enjoy self deprecating humor, which puts the spotlight on the same Jewish stereotypes we’re combatting around the world. Some of the characters embodied classic anti-Semetic images, such as the greedy, penny-pinching, shady businessman and the elitist, socialist, rebelling conspirator. Admittedly, I was totally entertained by these cliche personas, and reveled to have been included in on the “inside jokes.” However, should the same script been read in a theater in San Francisco, Anti-Defamation League’s hotline would go off the hook. Who’s knows, perhaps I would’ve placed a call myself. I learned from Israelis themselves that to laugh at Holocaust jokes is a right of passage to being a real Israeli. Well, what the hell, why not! If we take national ownership of the collective Jewish experiences, I suppose we can also chose to make fun of them. Just don’t dare attempt this humor anywhere else, or worse, among non-Jews. My colleague Anat, a real (lovely) Israeli, summed up our conversation on this topic in referencing a hilarious Seinfeld episode, where Jerry’s dentist converts to Judaism just so he can make Jewish jokes. Hard to grasp this hypocrisy? Don’t worry, it’s a ghetto thing!! This entry was posted in Aliyah, Entertainment, Tel Aviv by beatatude. Bookmark the permalink.